The Internet can give you an enormous boost while you are setting up your cleaning company. It can also provide a long-tail strategy for continued growth. Then again, it can be a big time-waster, yielding a very low return on investment. To get the most out of it, learn which service to use, when to use it, and how much energy to put into it. 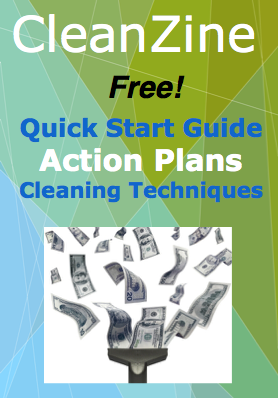 Using Facebook with your cleaning service business. This is about vetting your business more than anything. People don't go to Facebook with the mindset to buy something. If they are on Facebook, they are not in the mood to buy. They are in hangout mode. They may buy something, it does happen (to some extent), but not to the extent that Facebook would like you to believe. We have never had one customer purchase our services solely through learning about us on Facebook. On the other hand, tens of thousands of customers have come to us and purchased services from us through Google, Bing and Yahoo. Why is that? Because the reasons for going to one or the other are different. Facebook is about entertaining oneself; search is about finding solutions. It is good to include your business on Facebook, but don't tell yourself that it is as powerful for bringing you new customers as you might assume. Be realistic and have practical expectations about the marketing possibilities of Facebook. One possibility is that it will help brand your company, and give your brand the appearance of transparency. That is good. Do not conclude that you can bring in cleaning clients through Facebook. Rather, when potential customers do find you through Google, or through your real-world marketing, they will turn to Facebook to prove to themselves you do exist, and that your service is a normal, acceptable business. Using Twitter with your cleaning service business. Unless you are a personal coach, guru, comedian, news pundit or wannabe millionaire celebrity, I have a hard time seeing the point to Twitter for small service businesses. We have had several Twitter accounts since Day One for our online businesses (that does make some sense, as geeks love Twitter!). However, like Facebook, people largely use Twitter for entertainment or emergency situations. That is one thing I think Twitter excels at -- getting the word out during a hurricane, for example. Again this online tool is about looking cool and being transparent. Clients will trust you even more if you have both a Twitter and Facebook page. Set up an automated feed that updates both Facebook and Twitter and spend your time finding real-world potential clients. These clients will check out your business online after first getting an impression of you in the real world. Remember MySpace - yeah, me either! MySpace exists now as a data graveyard for upstart bands from years long past. Musicians discovered that it was a free way to promote themselves and organize a fan base for their band. Everyone else ran screaming towards Facebook, Friendfinder, and similar platforms. I suspect that Twitter will evolve into a way for celebrities to keep in touch with fans without be accosted by them in the real world. Hardly what the creators intended. Should I use the LinkedIn social network for my cleaning service business? This professional network is more geared towards networking between service professionals. This can give a boost in getting commercial-cleaning jobs, but will hardly attract any residential-cleaning work. Again, it is good to be have a profile on LinkedIn, but effective only to the degree that you put some time and effort into expanding a network. Do not just sign up and connect with only a few people. The way the platform is structured would make that appear as though you only knew a few people. Having a weak or undeveloped network actually looks worse than not even being on the network at all. Make a commitment to spend about a month building up your network. If you went to check out someone's LinkedIn profile and only saw three connections, you would probably assume that they were not very successful! That may not be the case. It may be that they simply lost interest (or did not bother to take the time needed) to build significant connections on Linkedin. We have a client whose cleaning business is suddenly spiking, due to Yelp. She wanted to try something different to get the word out, and it works for her, because several of her customers have written excellent reviews of her service. Yelp provides exposure through a different pipeline, but you have to get good reviews. Many cleaning services have no reviews on Yelp. The point is to come out on top, and instill confidence in customers who are searching for a cleaning service. If you use Yelp, be the best cleaner possible, and ask every client to write you a good review. Make sure your reviews are from people in the city or town that you serve. Do not ask your aunt who lives in another state to post a review. It looks fishy, and it is. That same client of ours used to do very well on craigslist. But lately craigslist has dried up, for the most part because now there are more exciting options, such as Yelp, but also because craigslist is not real friendly to business postings. Its infrastructure is antiquated. It is not much fun to use. Posts must be refreshed continually. However, in the early start-up days of your business, you can get attention and win accounts this way. It really only takes a few minutes to post your ad, and it will stay up for two weeks. In the beginning, it is worthwhile to post here, as an accompaniment to your real-world, direct-marketing tactics. When setting up a cleaning company of your own, direct marketing is king. It should be your primary focus. All of these social media services are useful and can help, but they function mainly to prove that you are a current, trustworthy company that is up with the times and fully vetted in the public eye. Social media services are much less about making direct sales than giving you a platform on which to shine. Online marketing is fast and easy to set up. It can even be sort of fun, if you are a geek at heart. Bear in mind, though, that some of our most successful clients do not have an Internet presence at all. They are just very good at going directly to the source and getting the work, even promoting that they are focused on the work at hand, and not on being online. Our advice is to get into three of these networks. Work to establish a unique voice over a period of time, so that you can be easily vetted by potential clients. But do not make the mistake of substituting social media for real-life marketing tactics that go directly to the source. A fifty-cent flyer on the desk of the perfect prospect is far more powerful than any amount of online activity. Put your online networks on the flyer. Now you're rockin'!